Market capitalization India produces approx 700 million pairs of leather footwear every year and accounts for an 18% share of the total Indian leather export. Over the years the Indian Leather Industry has undergone drastic change from being a mere exporter of raw materials in the early 60's and 70's to an exporter of finished, value-added leather products. The main reason behind this good transformation is the several policy initiatives taken by the government of India. Indian proactive government initiatives have yielded quick and improved results. Today the Indian leather industry has attained a prominent place in the Indian export and has made the industry one of the top 7 industries that earns foreign exchange for the country. Since 1991 as India adopted the globalization and liberalized economic policies, the leather industry has flourished consistently in several ways and has contributed heavily to the Indian exchequer. Investing in Indian Leather Industry is advantageous because the industry is poised to grow further and achieve a major share in the global trading market. The post liberalization era has opened up a great plethora of opportunities for the Indian Leather Industry. As the global players looking for new sourcing options while in addition to China, India stands to gain a bigger share of the global market. Leading brands from the US and Europe have plans to source leather and leather products from India. Indian Leather Industry currently is one among the top 8 industries for export revenue generation in India, holding 10% of the global raw material, and 2% of the global trade. India has become biggest livestock producer in the world, with the capacity of 1.8 billion square feet of leather production annually. Global Footwear of 13% production comprising of 16 billion pairs are made in India. India today produces 2065 million pairs of various categories of footwear. 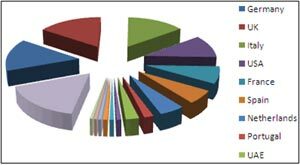 It exports 115 million pairs, thus having 95% of its production to meet its own domestic demand. Indian leather industry has the credit of being one of the oldest manufacturing industries catering to the global market from the 19th century. The age of the industry has linked it with social and organizational structure, and emerges as a complex one with elements of continuity and traditional structures. The ultimate quality of the Indian leather combined with efficient craftsmanship has secured a sturdy place for Indian leather goods in the global market. 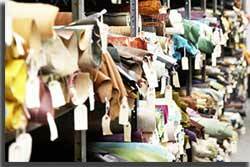 Indian leather industry is getting more organized, with a springing capacity for expansion. Indian Leather Industry has developed to a large extent and is the second largest producer next to China. The industry is equipped mostly with a potential for employment generation, growth and exports, with the annual exports touching 2 billion USD. The industry experienced a positive metamorphosis from being a transporter of raw materials to an established exporter of value added and finished leather products. Currently it is on an ever increasing phase with optimum utilization of available raw materials and maximum returns from exports. India has less than 3% share in the global trade in leather compared to China's 20%. Government of India realizing the growth potential of the leather industry has been making significant efforts to promote rapid advancement of the industry. On June 30, 2005, the Cabinet Committee on Economic Affairs (CCEA) decided to implement an Rs 2.9 billion scheme for the integrated development of the Indian Leather Industry. Under the scheme, existing tanneries will be modernized and new units will be set up for footwear, components and leather products. This scheme is expected to result in gains in terms of productivity, right-sizing of capacity, cost-cutting, and design-development. 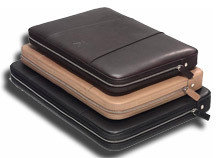 The leather and leather products industry is one of the oldest manufacturing industries in India. The Indian leather industry provides employment to about 2.5 million people in the country and has an annual turnover of approximately US$ 5,000,000. Indian leather Industry occupies a prominent place in the Indian economy in view of its massive potential for employment, growth and exports. There has been an increasing emphasis on its planned development, aimed at optimum utilisation of available raw materials for maximising the returns, particularly from exports. The exports of leather and leather products gained momentum during the past two decades. 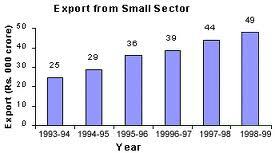 There has been a phenomenal growth in exports from Rs.320 million in the year 1965-66 to Rs.69558 million in 1996-97. 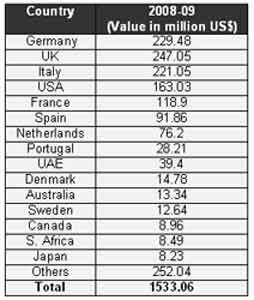 Today Indian Leather Industry has attained well merited recognition in international markets besides occupying a prominent place among the top seven foreign exchange earners of the country. Among all the industries the footwear industry in particular holds greater potential for investments in India. Today India produces approx 700 million pairs of leather footwear every year and accounts for an 18% share of the total Indian leather export. Indian Leather industry Today has capacity to produce l776 million pairs; 112 million pairs of Shoe Uppers; Non-leather footwear - 960 million pairs of non-leather footwear's which includes shoes made of rubber, moulded PVC and other material. Acme, Clarks, ColeHann, Deichmann, Nautica, Nike, Nunn Bush,Ecco, Elefanten, Hush Puppies, Double H, Florsheim, Gabor, Hasley, Justin, Marks & Spencer, Reebok, Salamander, Stacy Adams, Tony, Lama, Next, Bally are the prominent brands sourced from India. Lakhani, Metro, Action Red Tape, Bata, Liberty, Khadims, are some Indian brands that have a well established market in India. Aldo, Bally, Clarks, Ecco, Florshiem, Ferragammo, Hush Puppies, Lee cooper, Lloyd, Marks & Spencer, Nike, Nine West, New Balance, Reebok, Rockport, Stacy Adams are a few notable leather product brands sold in India. The Indian Leather industry categorizes under organized sectors and produces garments, leather merchandise besides tanning and finishing, with major manufacturing hubs in Chennai, Kanpur and Kolkata. Indian leather industry is set to boom with bright career opportunities in both technical and designing areas. The Indian corporates together with foreign multinationals in this industry have made it possible to look forward to exciting employment options. There are opportuntieis as designers, human resources and all the finance & marketing related jobs. The industry employs 2.5 million persons presently. The Indian federal government has earmarked a Rs 4.5 billion grant to be made available to the industry to boost the country's leather industry over a span of five years, the fund availability is conditional upon the sector's attracting an annual investment of Rs 2.2 trillion. In 2002, the investments in the Indian Leather Industry stood at Rs 410 million. Footwear and their components account for about 25 %of India's total leather products exports. These two markets also offer Indian leather industry vast scope for exports of saddler and harness. Products exported from India include dresses, shoes, casuals, moccasins, sports shoes, horacchis, sandals, ballerinas, and booties. Major production centres are at Chennai (Madras), Delhi, Agra, Kanpur, Mumbai (Bombay), Calcutta and Jalandhar. The government of India for it 200-2009 Foreign Trade Policy has identified the leather sector as a focus sector in view of its immense potential for export growth and generation of employment generation prospects. India is one of the best destinations in the world for investing in the leather industry because India is endowed with abundant raw materials required for the industry to grow. India has a huge population of cattle. India accounts for 21% of the world's cattle and buffalo and 11% of the world's goat and sheep population. The Government is also making efforts to implement various Special Focus Initiatives under the Foreign Trade Policy for the growth of leather sector. Leather industry is aimed to augment the production, thereby to enhance export upto US$ 7.03 billion by 2013-14 which shall create additional employment opportunities for overall one million people.